"I agree completely with the analysis of Angelo Taylor. To have incorrectly placed the hurdles in a 400 meter race is the ultimate insult to a runner. An incorrect hurdle setup on the track will by definition result in at least two errors that will affect the outcome of the race from the runner's point of view. This corrupts the results of the race and in most cases these types of errors are usually overlooked and the results usually stand as they are. In fact we are trying to project Track and Field as a professional sport and as such there needs to be available to the athletes judicious and effective remedy. The race shouldn't count for points or world rankings. This is likely his only remedy should this sanction occur. Could you imagine a NBA basket being placed at 11 feet in an game or the 3 point line off by 18 inches?" - Double Olympic Gold Medallist and one of track and field's all-time greatest athletes (and LRC visitor) Edwin Moses writing in an unsolicited email to LetsRun.com about the hurdles mixup at last weekend's adidas Track Classic. Moses' email and much more appear in our "Week That Was" recap. NRR: Married guys, does your wife buy your clothes? LRC: A Fan's Guide To The 2009 adidas Track Classic The meet is stacked and we give you an in-depth breakdown of all of the men's and women's mid-d and distance action and give you the highlights of some fantastic sprint action. A lot of story lines, including the return of Alysia Johnson in the women's 800. Will Shalane Flanagan or Anna Willard get the American record in the women's 5k and steeple? Can anyone challenge Bernard Lagat in the loaded men's 1,500? 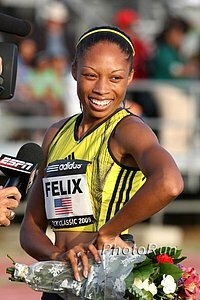 Plus the following non-distance stars: LaShawn Merritt, X Man, Jeremy Wariner, Terrence Trammell, Lauryn Williams, Muna Lee, Allyson Felix, Sanya Richards, Dawn Harper, Perdita Felicien, Stacy Dragila, Jenn Stuczysnki and others. Recommended Read: *Geb Still Has Big Goals It seems the only thing that has changed is Geb is now rich as hell and enjoys training alone. *Ato Boldon: "Thank God I retired before this guy (Bolt) started to run like this." *The Independent Profiles Bolt Bolt: "I am not going to let anyone change me ..."
*Bolt: "I'll take record to 9.4 sec." *Gebrselassie And Bolt Hoping For Records Bolt wants Bailey's 14.99 world's best for 150m while Geb wants the UK all-comers 10k record of 27:25. *Bolt Ready For Race That Is Reminiscent Of Professional Foot Races Held In 19th Century In Britain The "American Wonder" George Seward was the star back in the day. *Bolt: "Car crash has changed my outlook on life." Interesting Article On Michael Phelps' Return To Competition We're a running site, but it's fascinating watching Phelps deal with his Olympic success and fame. We wonder who will have the better 2012 Olympics, Usain Bolt or Michael Phelps? *Thread: Big Ten Men's 150m Won In Under 4:00! *Wisco Men Devastated By Loss Of Jager, Bethke, Eagon And Withrow, Have No Shot This Year They're taking the mass-redshirting route after Coach Schumacher's departure. *Jeff See Going For 1,500m Title At Home PSU's Sam Borchers got the 1,500m title last year. *Penn State Preview Awesome: Reigning champs PSU women will march out stud Gayle Hunter in the heptathlon, open 100 hurdles, 200, LJ and TJ!!! *Ryan Vail & Ok. St. Go 1-2 in 10km. *$1000 Fast Mile In Warwick, NY June 1st Looking for sub-4:10 guys. *Vin Lananna Wants Hasay To Anchor World Record 4 x 1,500 Next Year For Ducks Lananna is the king of publicity. Tennessee set the 4 x 1,500 mark pretty low this year with Sarah Bowman's super 4:10 anchor leg at Penn. Big 10 Final Results *Team Scores Penn State women win by 1/3 point over Michigan! Minnesota wins Men's. PAC 10 Live Results (Sat-Sun, Oregon Hosts) Galen Rupp entered in 1,500, 5k and 10k.